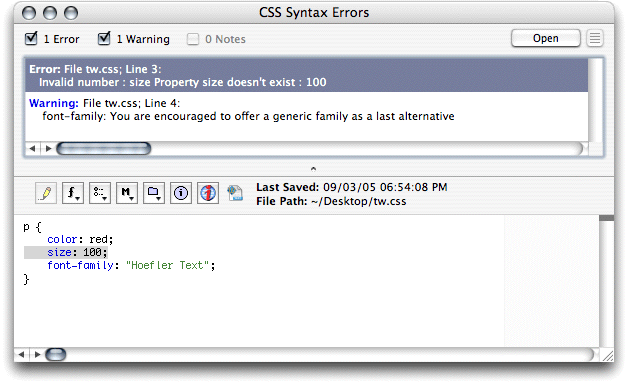 If you work on CSS using either of Bare Bones Software’s text editors, you might be interested in my latest project: CSS syntax checking scripts for BBEdit and TextWrangler. They’re a combination of Perl and AppleScript that allows you to syntax-check CSS files using the W3C’s CSS Validation Service. 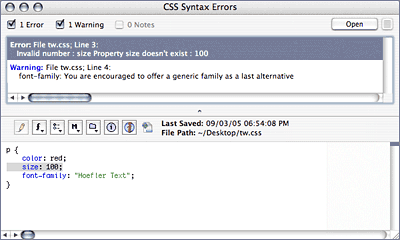 Errors and warnings from the validation service are displayed in a results browser, very similar in effect to BBEdit’s built-in HTML syntax checker. These scripts require Mac OS X 10.4 or later, and have been tested against BBEdit 8.2.3 and TextWrangler 2.1. I’ve had the idea for this for a couple of years, but I put off hacking it together because I have a strong aversion to screen-scraping. The W3C CSS Validation Service is a wonderful tool, but, alas, it has no proper API for calling it as a web service. What these scripts do is take the content of your frontmost window and pass them to the W3C validator’s regular CGI interface, the results of which come back as HTML. The Perl component parses this HTML and reformats any errors and warnings so the AppleScript component can display the results browser in BBEdit/TextWrangler. The problems with screen-scraping are obvious: if the W3C changes the HTML format of the validator’s output, my parser may break. Plus, even if they don’t change it, parsing the results as they stand is an inexact science. (Believe it or not, their output isn’t always well-formed HTML.) A real web-services API for the validator would be welcome. That said, it seems to work pretty well. My thanks to everyone who helped test this, particularly Nat Irons and Kevin C. Smith.